AccuClear® Ultra High Sensitivity dsDNA Quantitation Solution utilizes a novel, next-generation DNA binding dye for highly sensitive and accurate quantitation of purified dsDNA samples across a broad range of DNA concentrations. The assay is linear between 0.03 ng and 250 ng of dsDNA per assay in microplate format making it the most versatile DNA quantitation assay. Unlike absorbance-based measurements, AccuClear® dye is highly selective for double-stranded DNA over single stranded DNA or RNA. 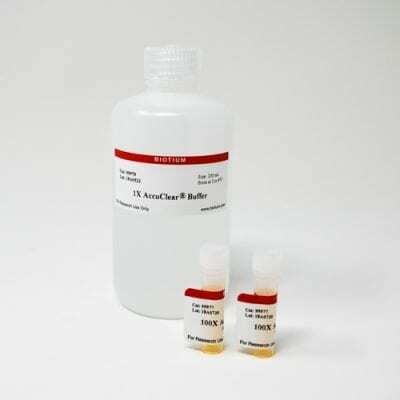 This product a standalone AccuClear® Quantitation Solution that does not come with any DNA standards, intended for users that wish to use their own DNA standards. We also sell complete AccuClear® Ultra High Sensitivity dsDNA Quantitation Kits that come with a set of standards (catalog no. 31028) or a single 25 ng/uL standard (catalog no. 31029). AccuClear® kits are intended for quantitation of purified dsDNA samples. For cell quantitation assays, please see our cell viability and cytotoxicity assays. AccuClear® technology is covered by granted U.S. and international patents. Qubit is a registered trademark of Thermo Fisher Scientific. QuantiFluor is a registered trademark of Promega.